TEEX Blog: Guest Instructors at Texas Fire Schools make the difference. Guest Instructors at Texas Fire Schools make the difference. The brotherhood of firefighters crosses borders and generations. 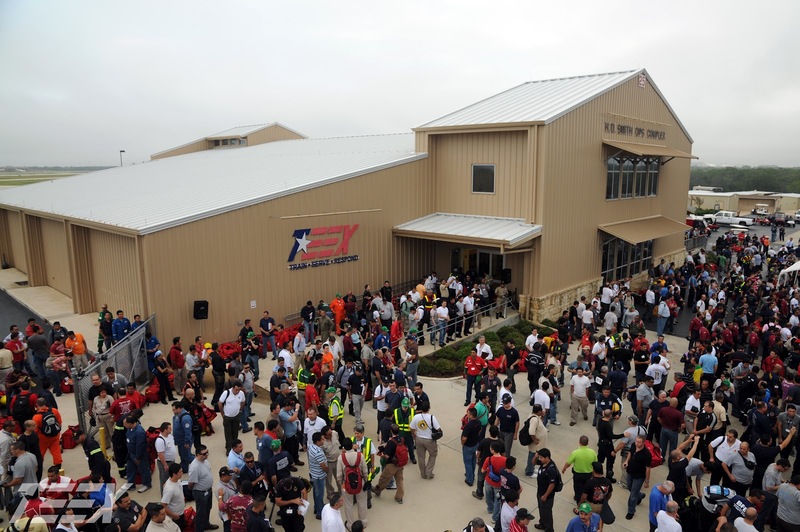 Nowhere is this more evident than at the Texas Fire Training Schools, held each year at the Brayton Fire Training Field in College Station, Texas, and conducted by the Texas Engineering Extension Service (TEEX). The schools began in 1930 when 196 firefighters gathered in College Station, near Texas A&M University, for the first Texas Municipal Fire School (watch this year's video). Other specialized firefighting schools followed. The Industrial Fire Training School, now in its 50th year, draws members of industrial emergency response brigades and safety officers from global oil & gas and chemical companies. The annual Spanish Fire Training School (Escuela para Bomberos en Español) is the largest fire school anywhere for Spanish-speaking firefighters. These world-renowned schools have earned their reputation in large measure through the generations of firefighters who have attended the schools and taken what they have learned back to their home communities. Volunteer guest instructors play an integral part in the equation. These Fire Training Schools would not be possible without the dedication of the guest instructors and safety officers who come each year to share their knowledge with the next generation of firefighters. They volunteer their time and expertise to make sure every firefighter who leaves is well-prepared and ready to respond when the alarm sounds – whether they live across the state or across the world. 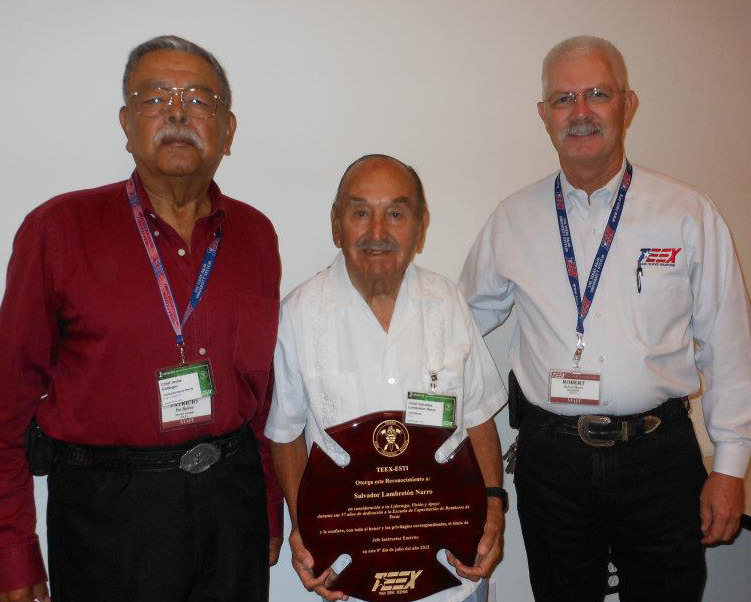 This year, TEEX honored two of these guest instructors who have served the Texas Fire Schools and the fire service for 50 years or more. 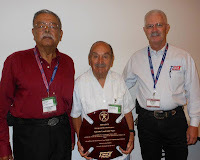 Chief Salvador Lambretón Narro was named Chief Instructor Emeritus and recognized for 57 years of leadership, vision, dedication and support to the Texas Fire Training School (shown at right in maroon shirt). 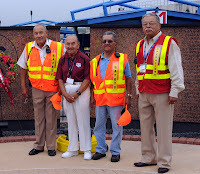 The retired Fire Chief from Monterrey, Mexico, was honored on the opening day of the Escuela para Bomberos en Español. 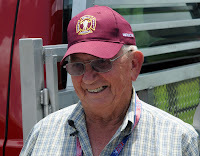 Chief Lambretón began his firefighting career in 1947 and first attended the Municipal Fire Training School in 1950. 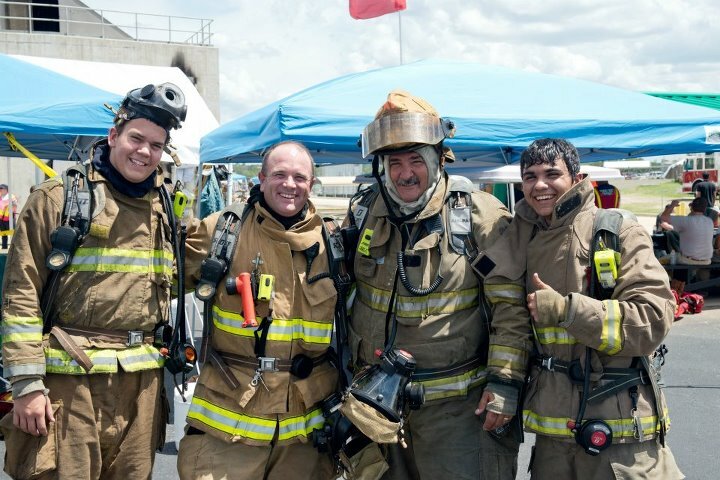 He collaborated with Fire School Chief Emeritus Henry D. Smith to establish a professional fire training school for Latin American firefighters, which has expanded to attract Spanish-speaking “bomberos” from 17 countries. See the KBTX story on this year's Spanish School. 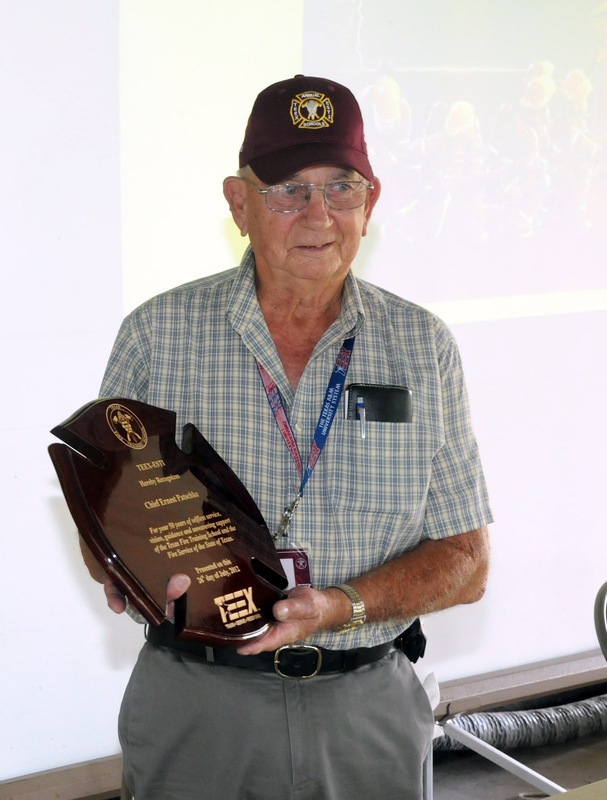 Chief Ernest Patschke was also recognized during the Municipal Fire Training School for his 50 years of service to the school as a volunteer guest instructor in pump and ground-cover operations. Patschke joined the Thorndale Volunteer Fire Department in 1951, and rose to Fire Chief. He attended his first Municipal Fire School in 1952 and became a guest instructor at the annual school in 1962, where he says students inevitably take away knowledge “they didn’t know they didn’t know” and can take that knowledge back to protect the citizens in their hometowns. Watch TEEX's Lee Hall awarding Chief Patschke in the KBTX video and read the Bryan-College Station Eagle article. THANK YOU, Chief Lambretón, Chief Patschke, and all of the guest instructors and safety officers who give of their time and experience to benefit firefighters from all over the world. We couldn’t do it without you! Escuelas para Bomberos de TEEX. La hermandad que existe entre bomberos trasciende fronteras y generaciones. Nunca está más evidente esta gran fraternidad que en la Escuela de TEEX que se organiza todos los años en el Campo Brayton de Capacitación para Bomberos en College Station, Texas. Los orígenes de la Escuela se remontan al año 1930 cuando se juntaron 196 bomberos en College Station, cerca de la Universidad de Texas A&M, para asistir a la primera Escuela para Bomberos Municipales (2012 video). Con el tiempo se fueron organizando otras escuelas especializadas para bomberos. La Escuela Industrial, que acaba de cumplir 50 años, es la meta anual para bomberos y profesionales de seguridad de empresas petroleras y químicas de todo el mundo. Y no hay escuela para respondedores hispanohablantes más grande que la Escuela para Bomberos de TEEX. Estas escuelas de renombre mundial se han ganado su fama en gran medida gracias a las generaciones de bomberos que han venido a capacitarse en College Station para luego servir de multiplicadores en sus comunidades locales. Los instructores voluntarios tienen un papel integral en este fenómeno. La Escuela no sería posible sin la dedicación de los instructores invitados y oficiales de seguridad que vienen todos los años para compartir sus conocimientos y su experiencia con las nuevas generaciones de bomberos latinoamericanos. Vienen como voluntarios a la Escuela para ayudar a preparar a los participantes para que estén bien capacitados y listos para responder cuando suene la alarma dondequiera que sirvan como bomberos. 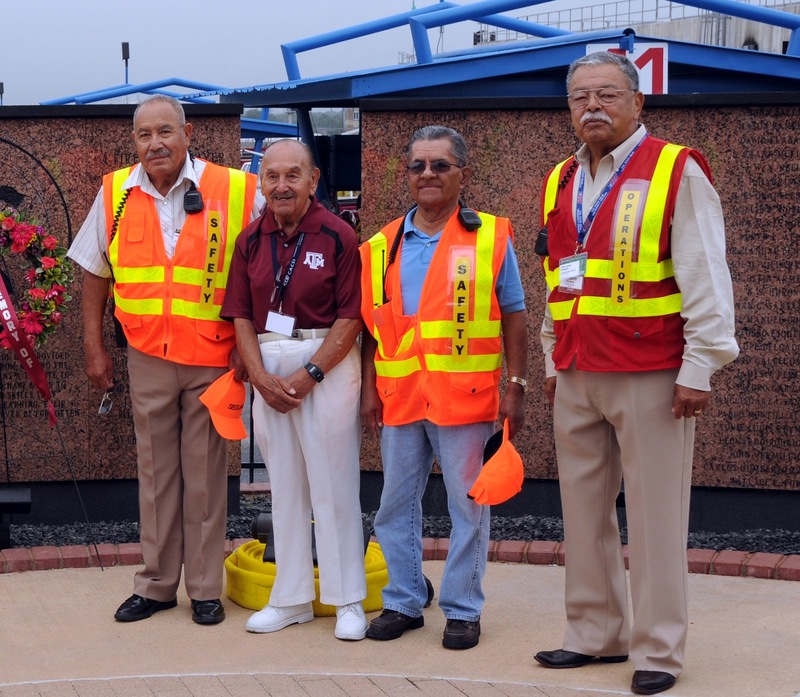 Este año, TEEX homenajeó a dos instructores que han servido a las Escuelas y al servicio de combate de incendio por más de 50 años. formación profesional a los bomberos latinoamericanos se entregó, en estrecha colaboración con el Jefe Emérito y Director de la Escuela Henry Smith, a la creación de lo que es hoy la Escuela para Bomberos en Español a la que asisten participantes procedentes de 17 países. Nota periodística en inglés. Durante el curso de la Escuela Municipal del corriente, TEEX también reconoció al Jefe Ernest Patschke por sus 50 años como instructor voluntario en los cursos de operaciones de bomba e incendio en superficies. Patschke se incorporó al Departamento de Bomberos Voluntarios de Thorndale en 1951, para ascender eventualmente al puesto de Jefe. Asistió por primera vez a la Escuela Municipal en 1952 y fue nombrado instructor invitado en 1962. Según el Jefe Patschke, los alumnos se llevan de la Escuela conocimientos “que no sabían que no sabían” para proteger a los vecinos de sus comunidades. Ver video KBTX y nota en el periódico Bryan-College Station. GRACIAS al Jefe Lambretón y al Jefe Patschke, y a todos los instructores y oficiales de seguridad que se ofrecen como voluntarios para beneficio de los bomberos de todo el mundo. Si no fuera por ustedes no podríamos cumplir con nuestra misión.